Paroriza pallens sea cucumbers were the most frequently encountered large deposit feeders on this dive. The species is hermaphroditic and was often observed in pairs such as this one. 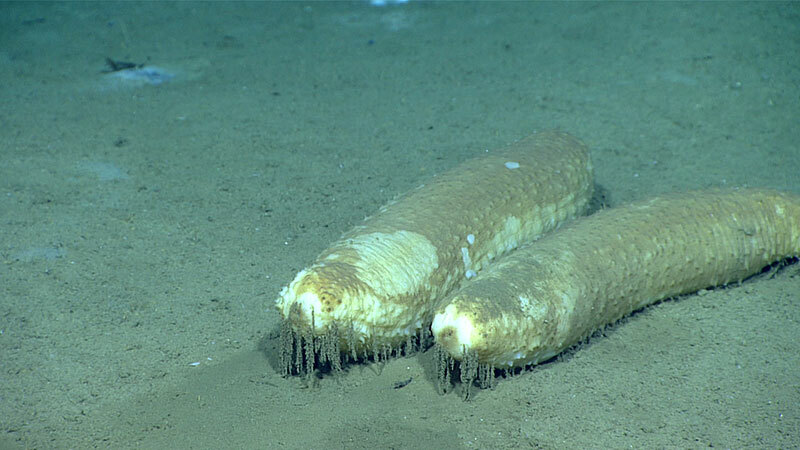 The nature of the shaggy filaments hanging from the flanks of these sea cucumbers remains a mystery. Image courtesy of the NOAA Office of Ocean Exploration and Research, Gulf of Mexico 2017. Download larger version (jpg, 877 KB). A dense cluster of Escarpia sp. chemosynthetic tubeworms at a cold seep, accompanied by an Alvinocaris sp. 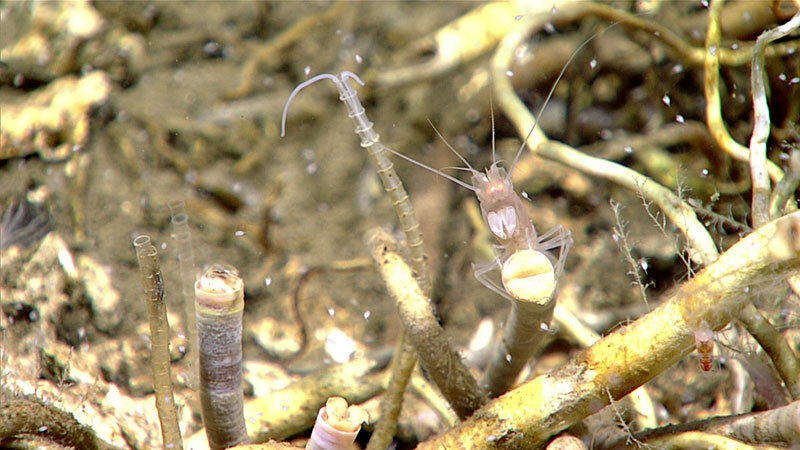 shrimp and a chaetopterid polychaete waving its pair of feeding palps from its slender bamboo-like tube. Image courtesy of the NOAA Office of Ocean Exploration and Research, Gulf of Mexico 2017. Download larger version (jpg, 960 KB). 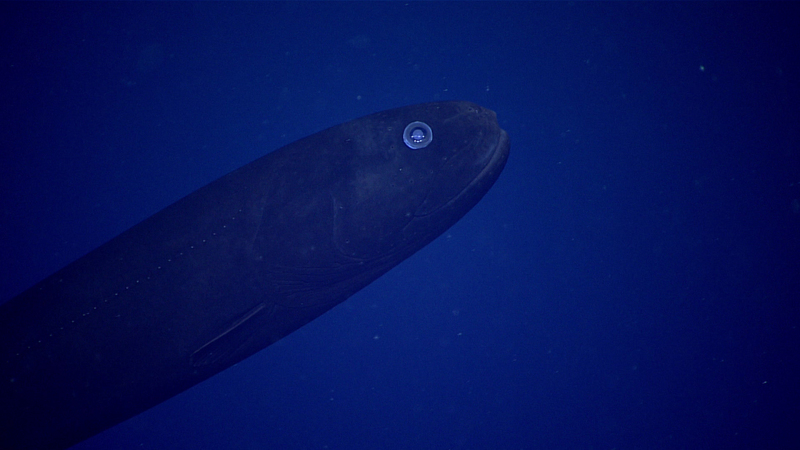 Fish experts on the global midwater team were blown away by the appearance of this fish from the genus Leptochilichthys. The observation placed this fish at a shallow depth of 900 meters (2,953 feet), when typical observations place this fish squarely in the bathypelagic zone at ~2,000 meters (6,562 feet). Image courtesy of the NOAA Office of Ocean Exploration and Research, Gulf of Mexico 2017. Download larger version (jpg, 589 KB). While exploring Dauphin Dome, we encountered this chemosynthetic community of copepods, shrimp, and other life thriving around a bush of Lamellibrachia sp. tubeworms. Video courtesy of the NOAA Office of Ocean Exploration and Research, Gulf of Mexico 2017. Download larger version (mp4, 26.2 MB). During today’s dive, we targeted the western edge of Dauphin Dome that had a number of Bureau of Ocean Energy Management seismic anomalies and water-column bubble targets detected by NOAA Ship Okeanos Explorer. Dauphin Dome featured at least 10 previously undiscovered methane seeps with small associated chemosynthetic communities. Most of these seeps were small crater-like features (the size of Deep Discoverer), lined with authigenic carbonate. Living within most of the seeps were dense bushes of tubeworms (Escarpia sp. and Lamellibrachia sp. ), some of which were parasitized by polychaete worms. At the seeps and within these bushes were a variety of organisms, including two species of polychaete worms, squat lobsters, snails, mussels, zoanthids, ophiuroids, actiniarians, hydroids, and large swarms of copepods. At one site, stoloniferan octocorals were also observed growing on the authigenic carbonates. Following the benthic portion of this dive, we conducted four exploratory midwater transects at depths of 900, 700, 500, and 300 meters (2,953, 2,297, 1,640, and 984 feet). A notable sighting of a fish, a look into the trophic ecology of the midwater, a small medusa, and wonderful protists were the biological highlights for this set of midwater transects.